Situated in Collingwood, Canada, Mountain View Villas at Cranberry feature beautiful views of the mountains and a quick drive to Wasaga Beach. When traveling to this beautiful area of Ontario, you and your family can enjoy downhill skiing in the winter and relaxing at the long freshwater beach during the summer months. Whether you are traveling with friends or the entire family – everyone will find something exciting to do at the villas. 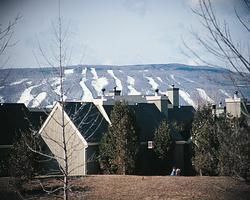 The Collingwood timeshares for sale at Mountain View Villas at Cranberry offer one-bedroom units. These units will sleep from two to six people with a variety of bed configurations. The full kitchen offers a stove, microwave, refrigerator, and dishwasher. Flat screen televisions are located in the living area and the bedroom and free Wi-Fi is also available. Many timeshare units also feature a fireplace for those cool winter evenings. Families can enjoy hanging out in the villa or exploring the local area. On-site amenities include three swimming pools, including one pool for adults only. An 18-hole golf course is located on the premises and the friendly staff will help you set up a tee time. There are hiking trails and a full-service marina located nearby. Vacationers often enjoy boating and fishing or scuba diving to admire the underwater life. A children’s playground and a game room also provide activities for the entire family. When you get hungry – visit the snack bar or restaurant for some local cuisine. Wasaga Beach is a beautiful area along the Nottawasaga Bay. 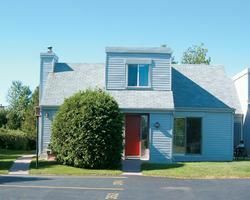 If you are planning a trip to Ontario, check out these Collingwood timeshares for sale - comfortable, family friendly units at Mountain View Villas at Cranberry. When visiting the area, you can take a day and drive an hour and a half into Toronto and enjoy some shopping or a production at one of the many theaters. While staying in the villa you can admire the views of the mountains and take part in the outdoor activities. Whether you are visiting in the summer or winter, you and the family will appreciate the friendly staff, comfortable units, and variety of activities at Mountain View. Contact Mountain View Villas at Cranberry Specialist Today!